I think I’ve mentioned my interest in horse agility on here before; Marty and I have played with “wild agility” in the past, back when we were still going out for walks, and once it became apparent that he was probably not going to become a riding mule I started looking for things that I could do with him instead. Agility appealed to me because it seems that, in order to do it well, you need to have an excellent foundation in groundwork. All the things about the way my mules handle that I consider important are required here: it can’t be done if you’re pushing and pulling on each other! 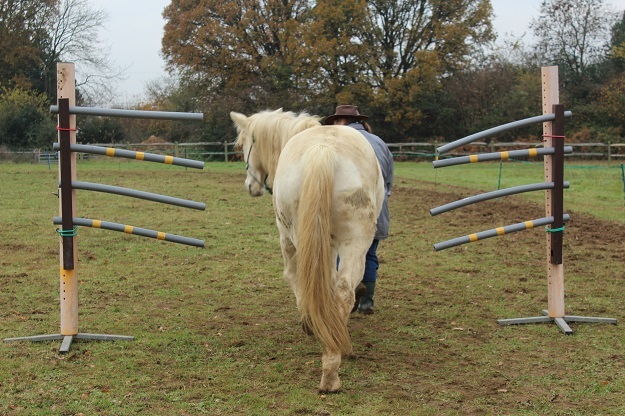 Agility not only helps you work on and improve those basic leading skills, but it prepares your horse or mule for many other situations that they might encounter during their life – for example, going under arches or through narrow gaps is great preparation for loading. It’s also an excellent bonding exercise and can help improve confidence. A fantastically weird photo of Marty and Dad. 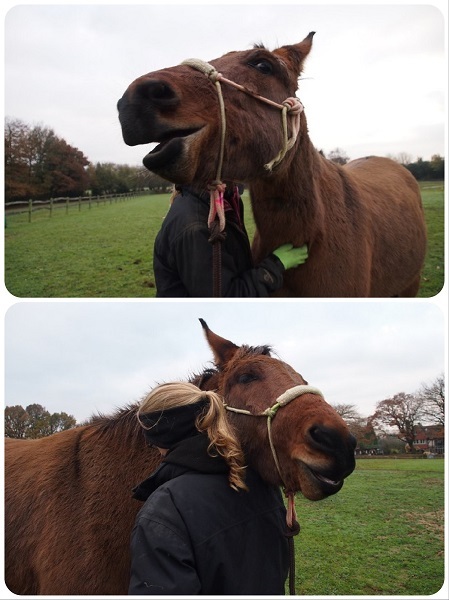 …Oki, maybe this is just the effect Dad has on mules. 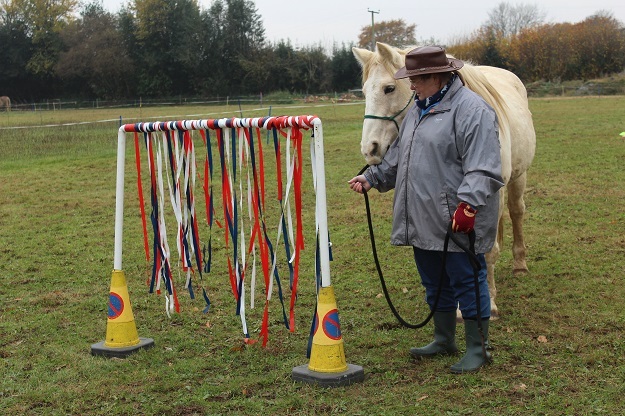 Through a comment on a Facebook thread I discovered Online Horse Agility, which sounded like a lot of fun, but I had no idea where to start when it came to creating my own course. 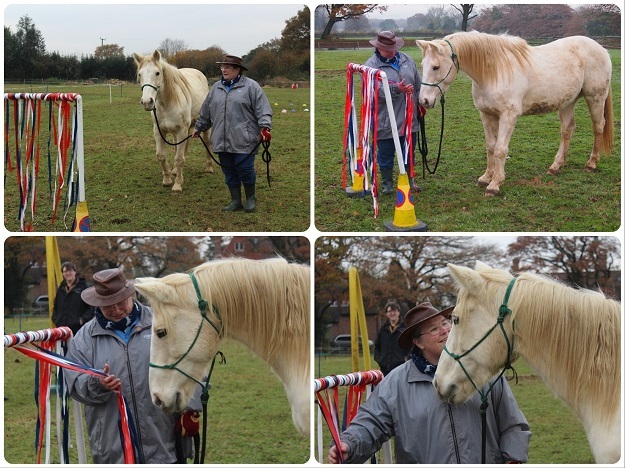 Fortunately, I’d been following Horse Agility Sussex & Kent and I messaged Sue to see if she would be able to come to Surrey for a lesson. Much to my delight, it turns out that she has another client nearby and so we were able to arrange a date. 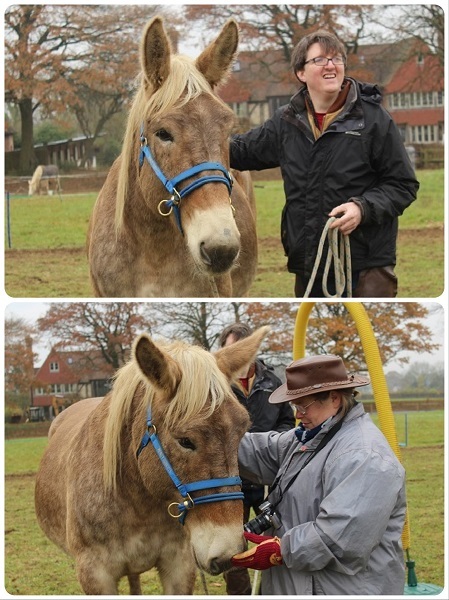 Ben took Xato, I had Marty, and my mum came along to have a go with little Cash pony – he was an honourary mule for the day! 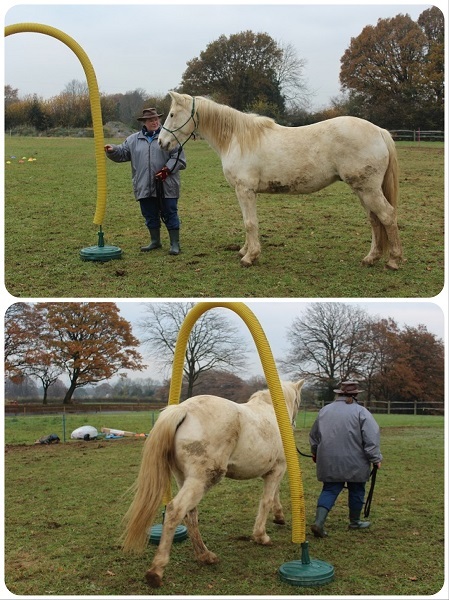 Sue noted that Xato chose to sniff the inside of the archway, whereas most horses sniff the outside. Marty did the same. 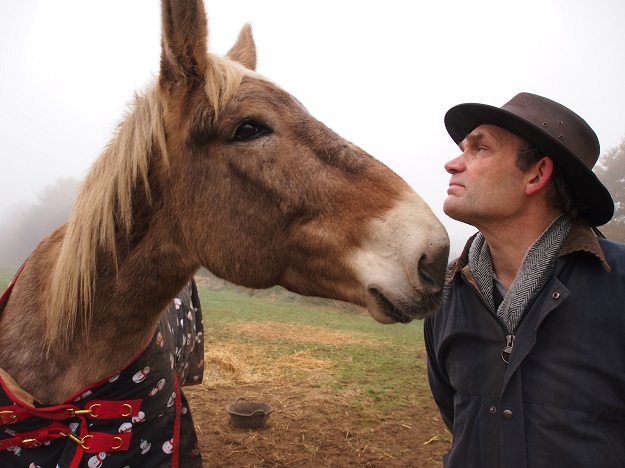 I wonder what prompts a mule to check the inner and a horse to check the outer? 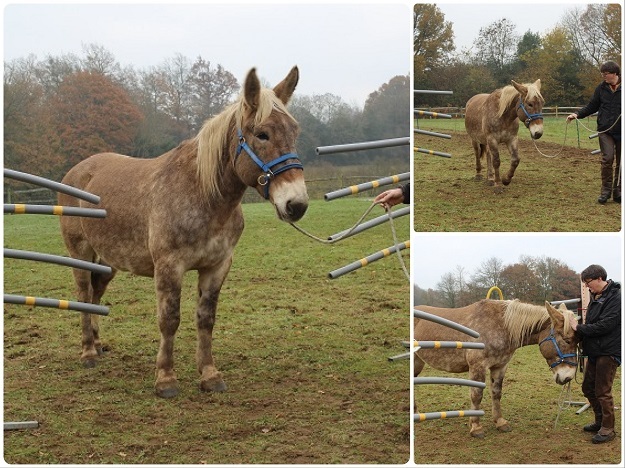 The squeeze was easy for him; none of the equines progressed to actually brushing against the piping, purely because we only did short sessions with each of them, but we started with the squeeze wide apart and gradually moved it closer. 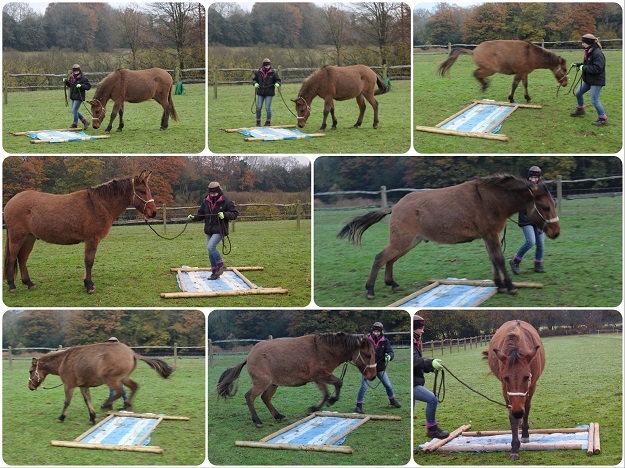 Once Xato could do that Ben practiced halting him and backing him up through it (the bottom right picture is Xato getting a headrub – not Ben attempting to push him backwards!). 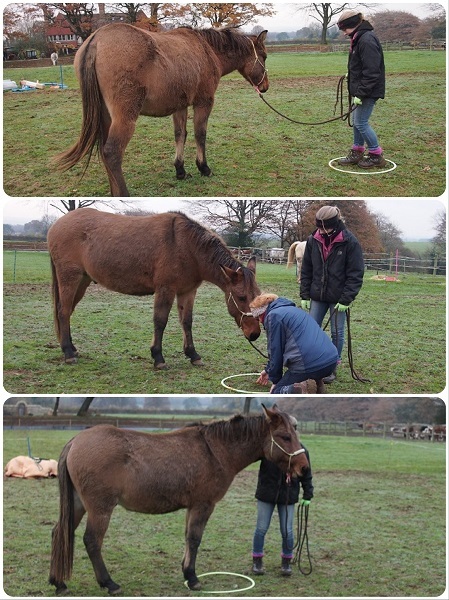 The aim of the hula hoop was the get your equine to step one foot inside it. Xato did it straight away. 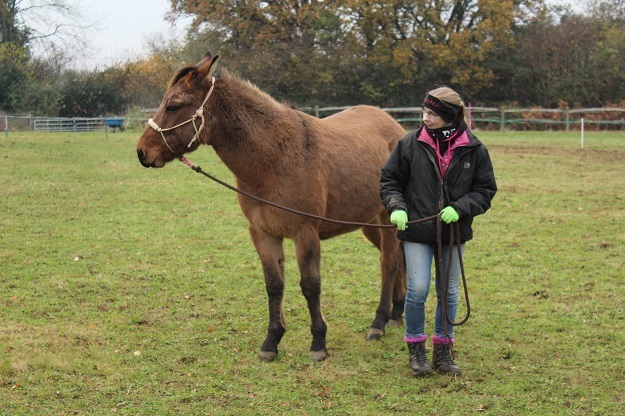 Xato being a goon – I’ve noticed that he likes to eat his leadrope when he’s feeling a bit concerned about something! 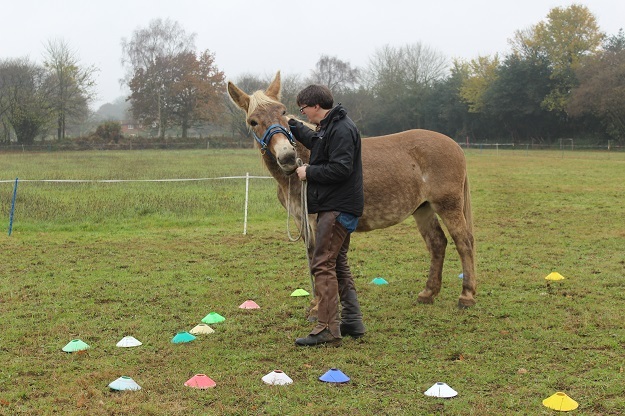 This obstacle required him to walk in and then turn without stepping outside the cones, which was a little difficult for him as we are still working on his bend. The curtain starts low, as Sue said that the height can sometimes intimidate them. Xato was a little wary, although he certainly doesn’t show his concern as much as Marty does! So we have to be aware of that. 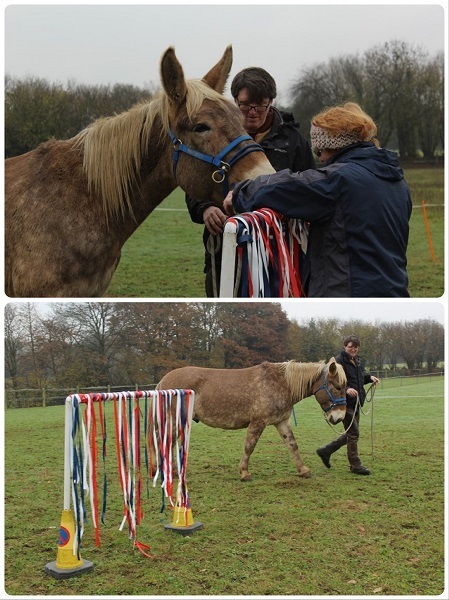 Although we all did the course individually, so I could have taken both mules myself, I’d asked Ben to take Xato because I was having a silly confidence wobble and I didn’t want to screw things up for Xato by passing my anxiety on to him! I was soon able to see that he was taking it all in his stride, and I did have a little go with him myself afterwards – unfortunately there aren’t any pictures of that, so you’ll have to take my word for it. Next up was Mum and Cash. I was super proud of these two: Mum hasn’t done anything like this before, and Cash pony has come a hell of a long way from when Ben first got him. 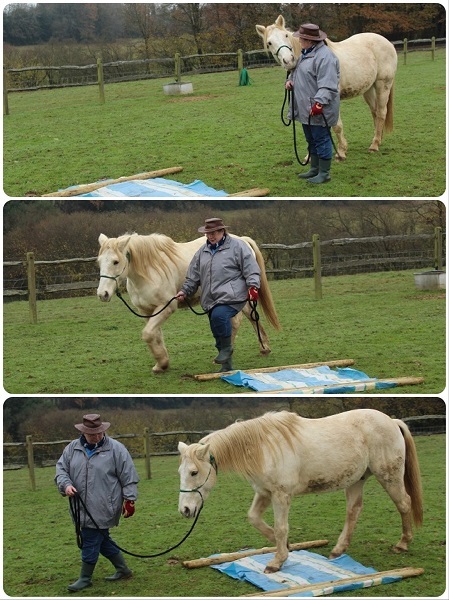 For him to be able to tackle these obstacles as well as he did, with a brand new handler, was really good. Mum did all the right things and he clearly had a lot of confidence in her. 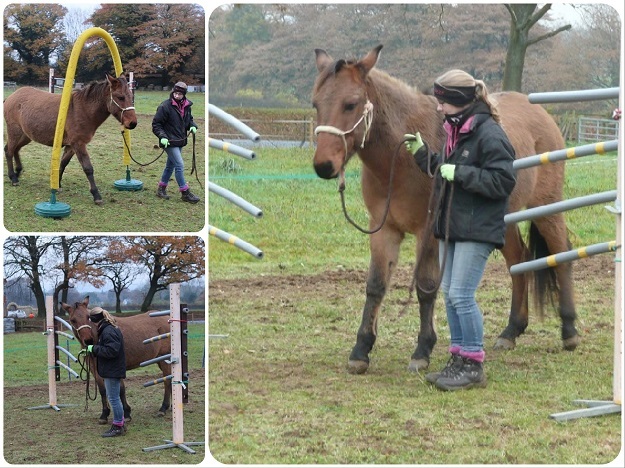 It can be pretty intimidating to step up and do something like this when you’ve never handled the horse before, you don’t know where all the “buttons” are, and people are throwing around horsemanship lingo like they expect everyone to understand it – so huge props to Mum for stepping up to the challenge! Mum and Cash checking out the curtain. Then the curtain was raised and they went under it! The squeeze was no problem for Cash, either. Then again, he does often have to squeeze between his enormous haynet and the doorframe whenever he’s stabled at night! The tarp was easy-peasy, too. Check out how perfectly in step they are in the second photo! Cash had been through the arch a number of times without incident, and then unfortunately he decided to go round the outside at the last minute and the leadrope caught on the frame, rocking it. Mum was patient and was able to bring his confidence back again! I think Mum enjoyed herself! Marty had been watching all this from his pen, as we expected him to find this quite a challenge and were hoping that he would gain confidence by seeing his fieldmates complete the tasks first. I have to say, I am immensely proud of the little guy. You can see from the photos that he certainly had concerns, and was doing a lot of thinking – remember that with mules, ear and tail signals are a little different and so ears facing backwards and a busy tail often means they’re contemplating what’s been asked of them – but you can also see that I wasn’t forcing him to do any of it, and there were no explosions or Marty Meltdowns. He really has matured so much. The tarp was a huge thing for us. On the very first day we met Marty, we asked him to cross a tarp. He did so easily, but on the way back a gust of wind caught it and caused it to rustle as he was halfway across. We spent a long time trying to persuade him to go near it again, but that was it: he had made up his mind! So I feel that this is a real milestone in our journey together. He was so careful with his jumping, and – as Mum observed – really energy-conserving! It helped him to see me and Sue walk on the tarp. Once he’d walked over it, he got a very good scratch! As you can see he loved it and was very pleased with himself! The archway and the squeeze were easy for him; I think the work Anna did with him helped prepare him for the squeeze! We also practiced halting halfway and backing up. The curtain was another obstacle where Anna’s work with him really shone through. The hula hoop was really difficult for him, which surprised me as we’ve done a lot of work on moving individual feet and asking him to step a foot onto or over something. I stood (and danced) in it to show him that it wasn’t a pit, and Sue tried to persuade him that there was something tasty in there which he might like to investigate (you can see what he thought of that ploy). Eventually he decided to do it HIS way and put both feet ON the hoop! My Dad took a couple of videos of Marty and I, which was greatly appreciated – I wish I’d thought to video more of the day! Here are some moments from our tarp crossing; the calm walk across was not captured, but you can see some of the process that led us to that point. 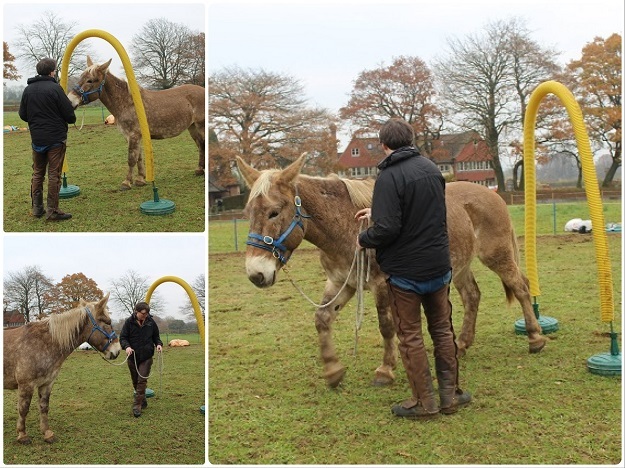 And here is a bit of video from our hoop work, including the stand! I’m really glad I organised this. 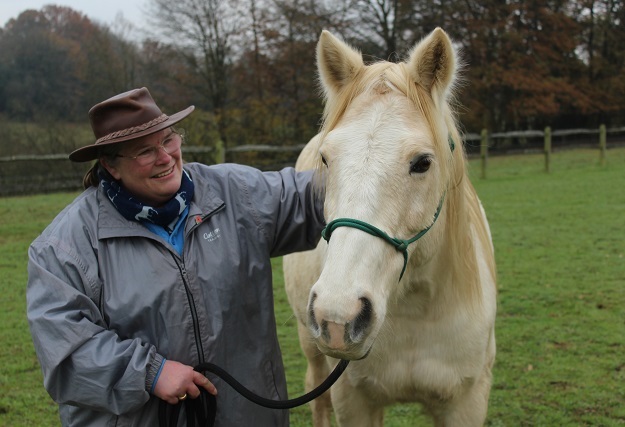 Sue said some very nice things about our equines and the way we work with them, and it was good for me to hear that; as you know, I lost a lot of confidence with Marty and questioned myself a lot, so it felt a little like someone had pulled that curtain a little further away from the window and let another shaft of sunlight in. There will always be room for improvement, but we aren’t awful either! Fabulous photos and videos. 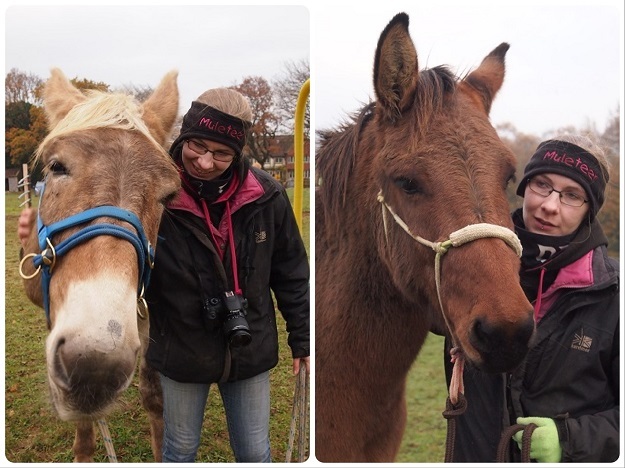 I have 2 mules and a hinny and a blind donkey . I have been competing in real time agility for the last 3 years. Milo who is working at advanced level recently came 8th in the real time world league. Really proud of him. Milo is not riding mule. 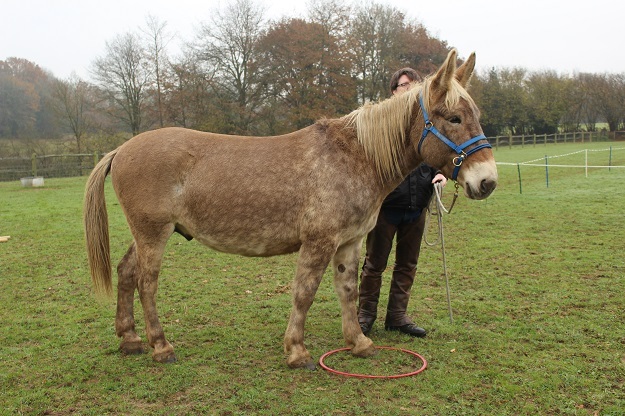 My other mule Wallace I can ride, and have just started competing him in Agility. Hoping to compete all four in online agility and Wallace in equagility . I live in South Gloucestershire. Hi Lesley, I’m sorry for my late reply – sometimes genuine comments on the blog get buried beneath the spam. 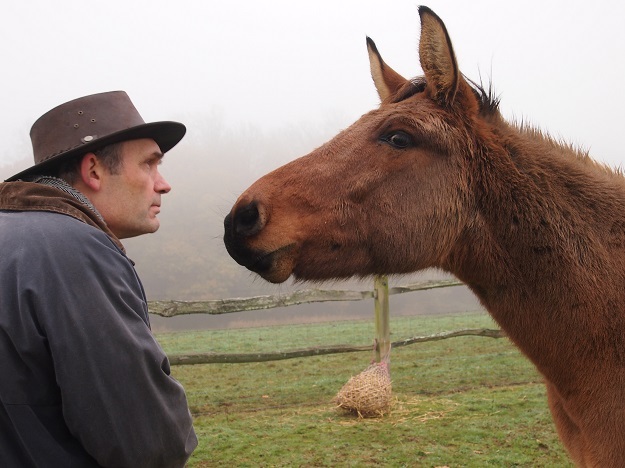 I’m really interested to hear about your mules and agility triumphs! 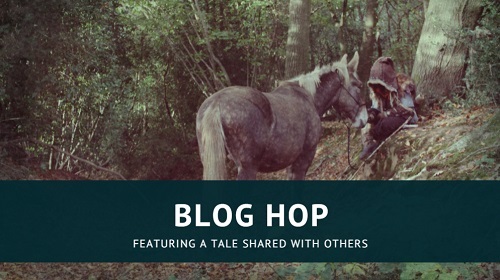 Would you consider writing about one or more of them for my Mule Tales feature?